The celebration of mangoes will come into sharp focus for the Nevis Tourism Authority when the fruit, widely available on Nevis, becomes a key feature in its culinary tourism activities. The Authority’s Chief Executive Officer (CEO) Greg Phillip told the Department of Information on May 20, 2014, that during the summer monthsâ€”when the fruit is availablee in abundance on Nevis, coupled with the usual slow pace of summer, where tourism was concernedâ€”was the ideal time to drum up interest. “Summer in Nevis is usually quite slow when we think about tourism and we at the Nevis Tourism Authority, are doing quite a lot to influence the summer differently and when I say influence it differently, I am talking about making sure that we get a lot more visitors to the island during the summer. “We have launched a number of things to essentially try to accomplish that goal and the most significant thing that we have done as an original initiative, is really the celebration of mangoes which will happen here on the island of Nevis between June and July. Simply put, it’s really an opportunity for us to develop something that helps us to use and to celebrate something that we have here on the island in abundance,” he said. 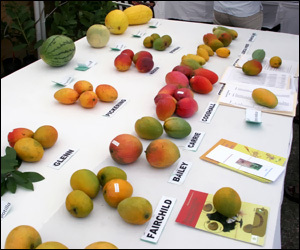 A Mango Festival is also planned for Charlestown in July, which will be held in collaboration with the Department of Agriculture which had held a similar activity in the past. According to Mr. Phillip, other destinations in the region were already engaged in food-related activities, among them St. Lucia which has a Chocolate Festival that but none had activities related to mangoes. “On Nevis we have an abundance of mangoes and we have developed a celebration of mangoes that is geared not just as a tourism product but it’s also to embrace the people on the island here on Nevis. “We are working quite closely with the Ministry of Agriculture and also with our tourism partnersâ€¦ During the mango season every restaurant on the island of Nevis and every hotel, will participate by ensuring that there is, essentially, a mango menu with dishes that are locally-made from the mango fruit. That’s important because it adds another dimension to what we have on the island of Nevis to promote as a tourism destination, so those folks who are here during the summer months,would have something else to do,” he said.